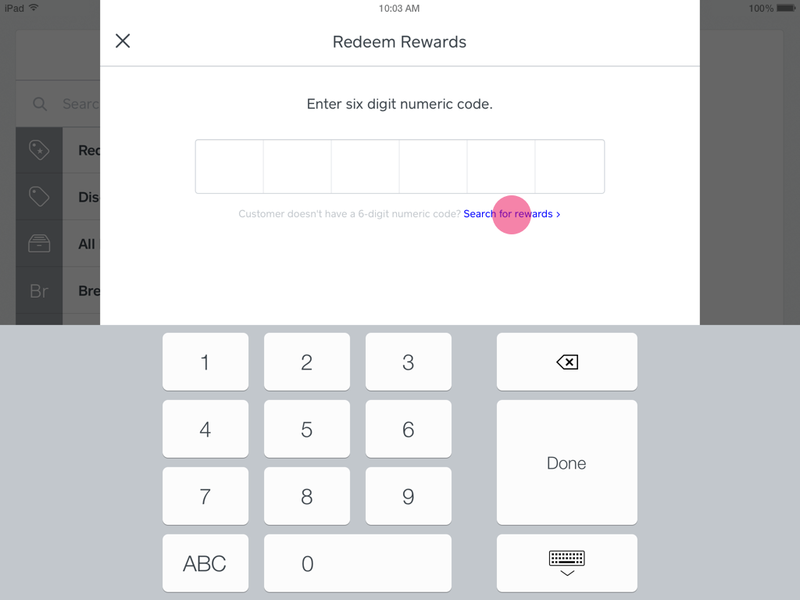 You can redeem rewards from the Square app by searching for your customer’s name, email address, or phone number, or by entering their reward code. Be sure you’re using the most updated version of the Square app to access this feature. On an Android device, tap Rewards. On an iOS device, skip to the next step. Tap Use Code > enter your customer’s 6-digit reward code (found in their email), or enter their email address or phone number to search for available rewards. Note: All customers that receive a reward will receive a 6-digit coupon code. If your customer does not have their reward code, you can search for their reward using their name, email, or phone number. Select rewards to apply them to your customer’s cart. Multiple rewards of different types can be applied at the same time. For example, you can apply a reward for a percentage, and additionally a reward for a dollar amount on a single sale. If only one reward is available, that reward will automatically be applied. A single reward cannot be applied to more than one sale, even if the full reward is not redeemed. Note: A punch card needs to be complete in order for the reward to be searchable in the Square app. If rewards are unavailable, No Matches Found will appear. You can also view or remove rewards applied to a sale from the app’s payment screen. To do so, tap Discounts from your current sale to show the applied rewards and/or to remove them from the sale.